Life at Busy Solitude Farm: Stars in our Eyes! A few months ago I entered one of my favorite photos of Oskar and Ulani in a competition for the Michigan-Ohio Briard Club's 2011 calendar. Guess what? We got the cover! Don't they look great peering out at you? For quite a while I used this photo as my computer desktop -- it looked like they were inside the box, looking out. Want one? They will soon be for sale on the MOBC website for $20 plus $2 s/h. 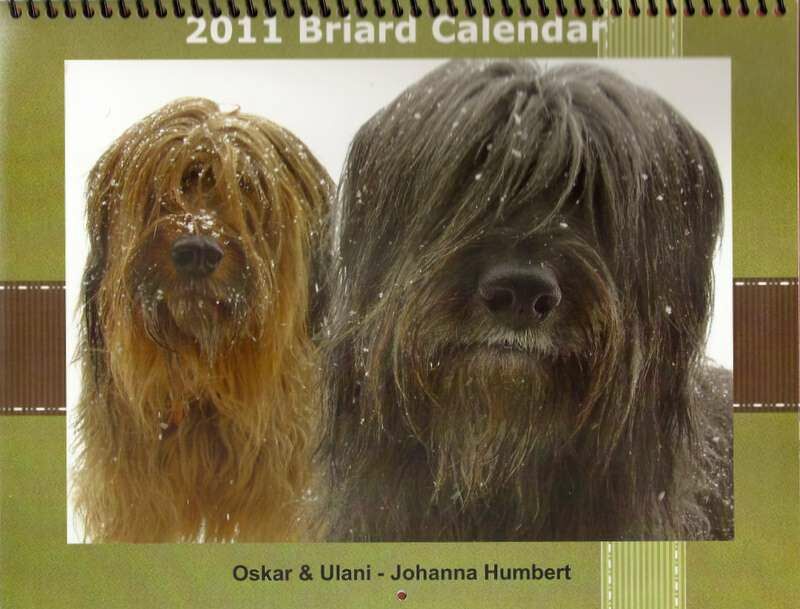 It's a fundraiser for the club and full of lots of lovely Briard photos. Now I have to deal with dogs in the limelight. Ulani already asked for an iPhone so that she can Twitter with her fans! Honestly! Oh, fame has gone to their pretty little heads! They are beautiful. Congratulations to you all. That's a fantastic shot of them. How great that they made the cover!